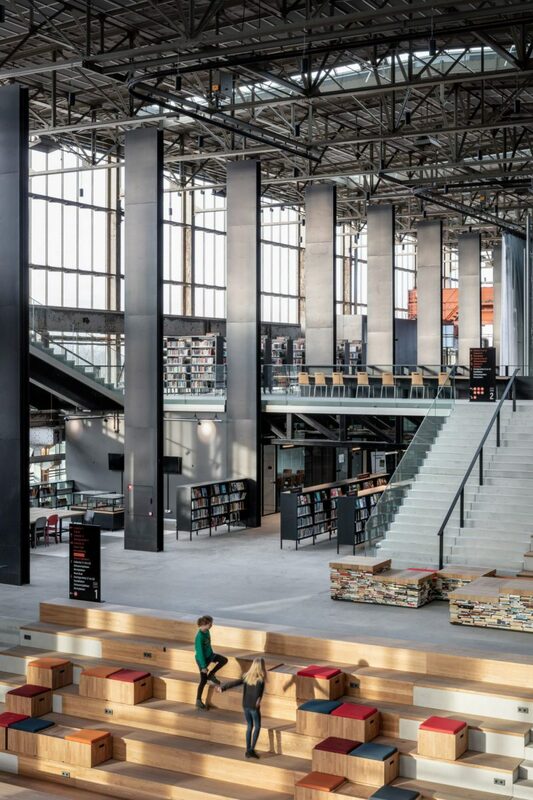 Dutch agency Civic Architects recently transformed a former locomotive shed in Tilburg into a public library and event space. The no-longer used industrial hall has become an impressive, multifunctional indoor city square. 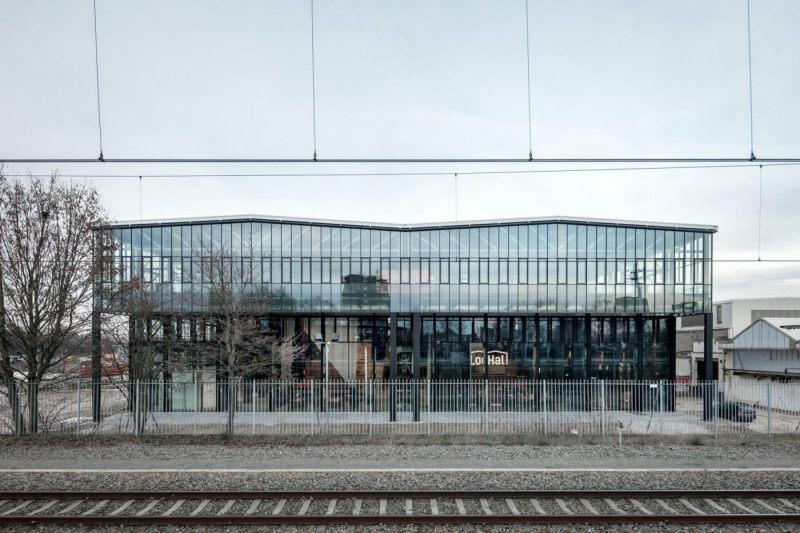 Named after the locomotive shed in which it is situated, the LocHal Library covers an impressive space in a 15 meters high building with a 60×90 meter footprint. 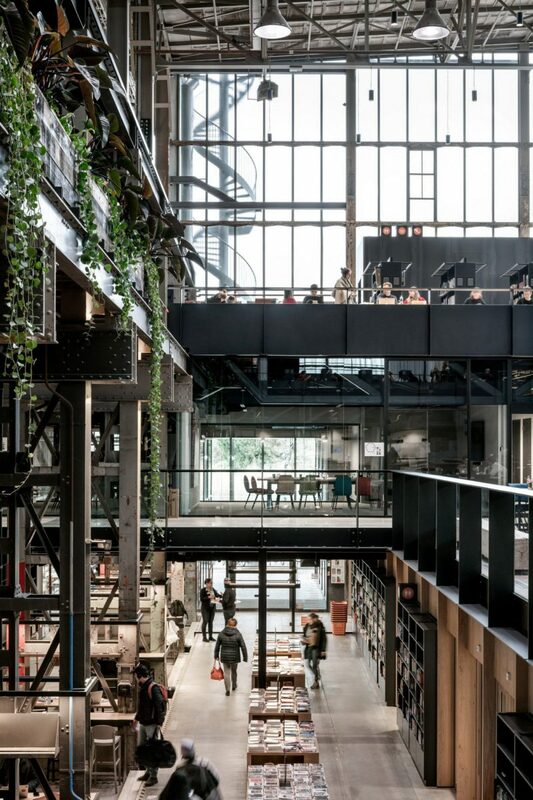 Amsterdam-based Civic Architects completed the impressive interior with the help of Braaksma & Roos Architects and Inside Outside. The converted building maintained much of its industrial look and structure with tall glass windows shaping the space and bringing lots of light into it. 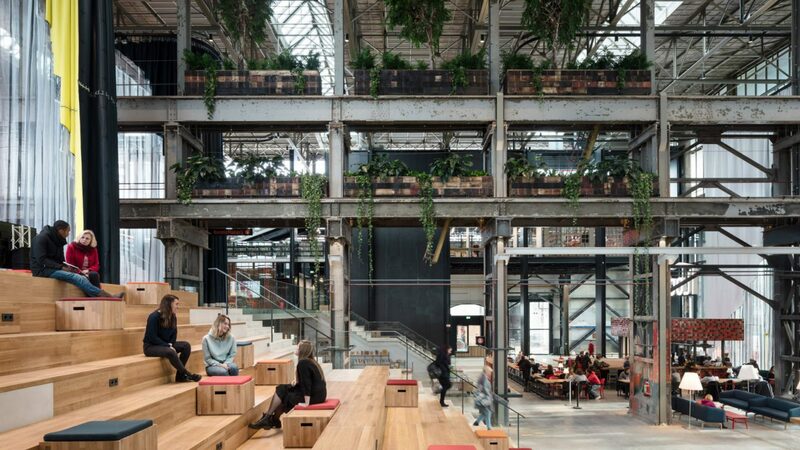 The reinterpreted interior of the former locomotive shed now includes structures made from black steel, concrete, glass and oak which divide the space. A number of movable textile screens can also be found inside of the library, their aim being to create temporary zones within the building. 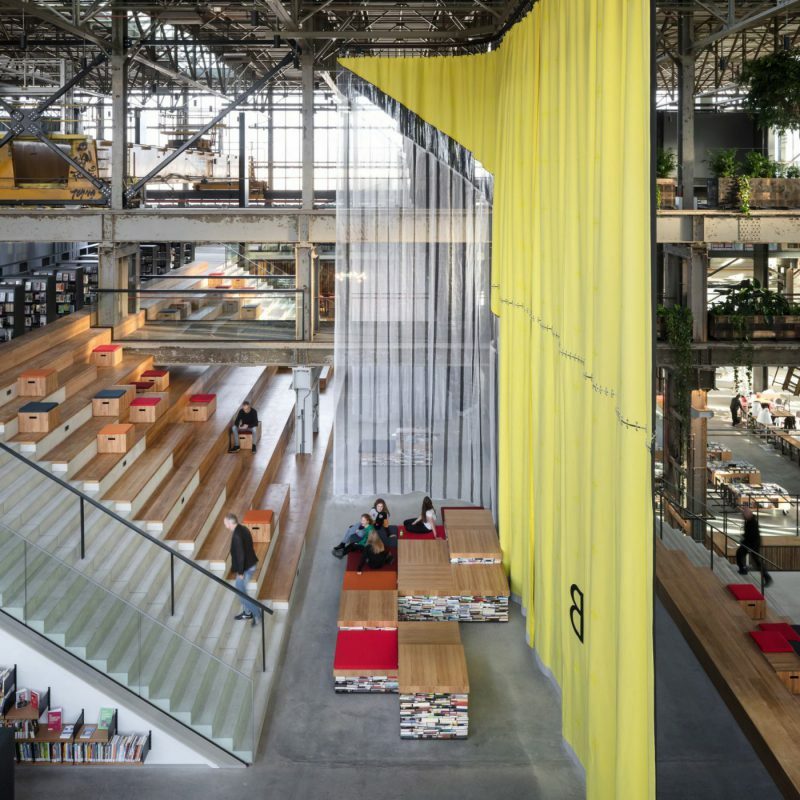 Designed by Inside Outside and woven in the Tilburg Textile Lab, the textile screens create smaller environments within the large hall and furthermore improve its acoustic properties. The position of the screens can be changed using a computerized system to either create a small semi-private auditorium, conceal the coffee kiosk or create a backdrop for it or even soften the light coming into the library. The entrance hall of the building can be compared to a covered city square with big reading tables which also serve as podia, an exhibition area and a coffee kiosk. Wide and tall stairs connecting the ground floor of the building to its upper floors can be used as seating during events for over a thousand spectators. 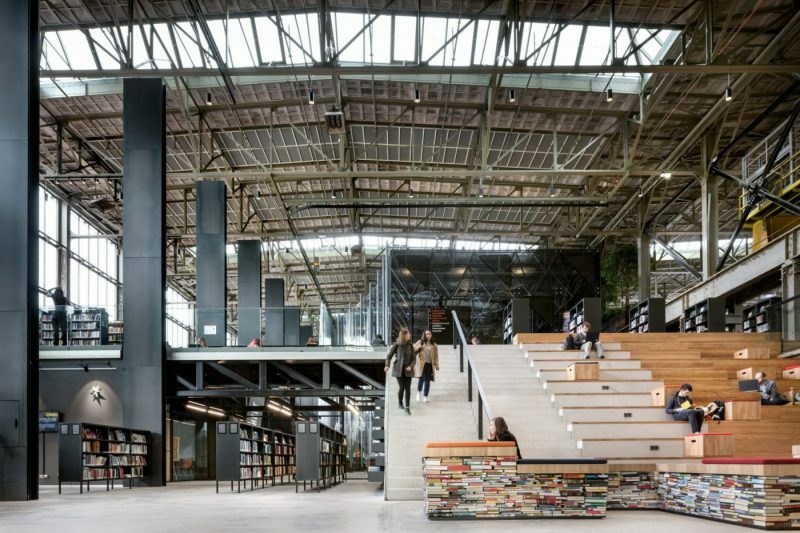 The converted locomotive shed does not only serve as a library. The space also hosts meeting organized by cultural organizations such as Kunstloc Brabant and acts as a co-working area. In a few ‘labs’ scattered around the interior, e.g. a Food Lab or a DigiLab, visitors can learn new skills during their time at the library. There is also a children’s library, inspired by De Efteling — a theme park nearby Tilburg. Bringing life into the railway zone close to the Central Station of Tilburg, this project contributes to the development of that area and its road to becoming a new cultural center. The library not only revived a locomotive shed, but thanks to its design and concept it’s also bringing people back to books. It does an amazing job in creating a modern, multi-purpose public space under one roof. I know you guys like new-style street and commmunity libraries (like this one, this one, this one or this one), so I’m happy to share another library project I came across. Inspired by the Little Free Library movement, Boing Boing blogger Amy Seidenwurm decided to open her own library in public space with help from friends and relatives. ‘Little Free Library #2646’ is located on a “sad vacant lot near our house and a nursery school”, Seidenwurm explains. The Little Free Library project started out as an idea to promote literacy and the love of reading by building free book exchanges around the world. Over the last years the project has grown into an international movement with more than 2,510 (!) community-driven libraries. I came across an interesting story on Tokyo Story about a book-sharing system in the metro of the Japanese capital. If you go to Nezu station on the Chiyoda subway line of the Tokyo Metro, you will find these unusual bookcases. In the shape of an old fashioned metro train, this public book-sharing installation enables travelers to read whilst sitting in the driver’s compartment of the fist carriage. You can also take a book with you to read while commuting in the ever busy Tokyo subway. As soon as you have finished it, you can return it.